Why can’t we bundle it? 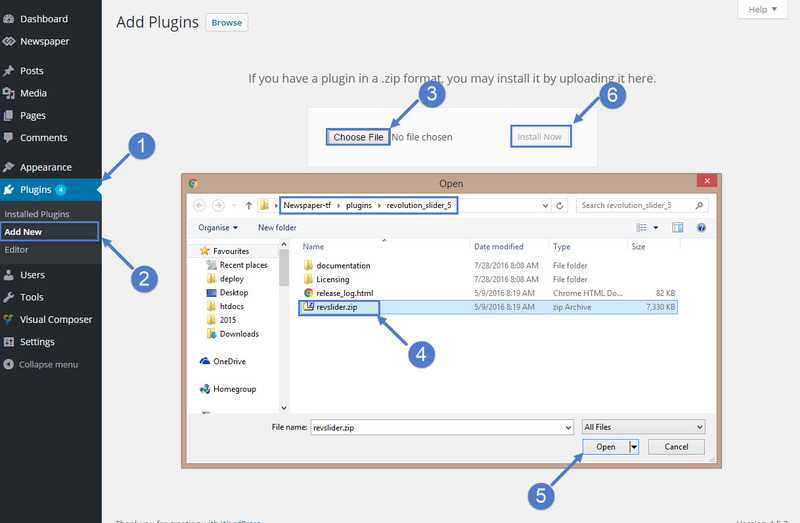 Our “Plugins panel” has to have all the plugins bundled into the main theme.zip file to be able to install them and we always try to keep our main theme file under 8 MegaBytes because that’s still the default upload limit on a lot of hosting environments. Due to licensing restrictions, we cannot download it from our servers to your host, it has to be bundled with the product. Revolution Slider 5 has grown from 1.5MB to almost 5MB. Go to your WordPress admin panel and open the Plugins > Add New section.Click on the Upload Plugin button and browse your local computer to find the Newspaper-tf > Plugins > Revolution Slider 5 folder. Select the revslider.zip file and click the Install Now button.